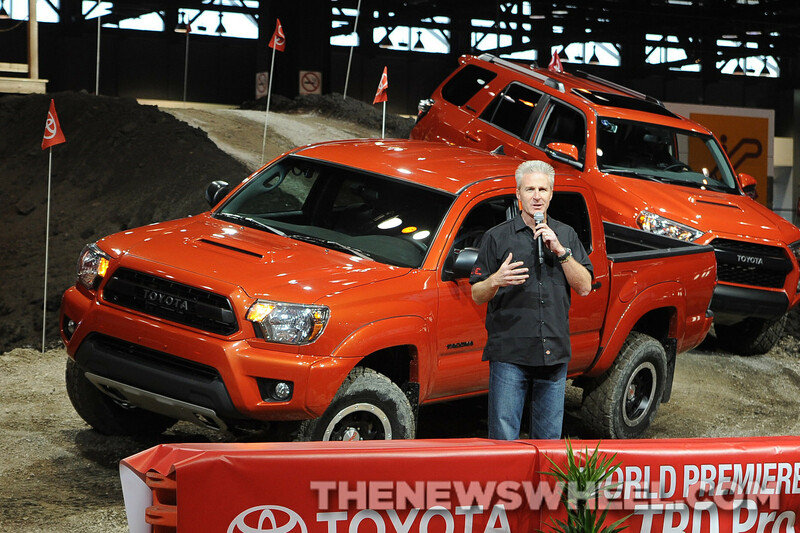 The TRD Pro Series Trucks being announced at Chicago Auto Show. Last week at the Chicago Auto Show, Toyota showed off its all-new TRD Pro Series trucks (in striking Inferno Orange exterior paint jobs), which include the TRD-enhanced (Toyota Racing Development) Tundra and Tacoma pickups and the 4Runner SUV. These monsters have been doctored up with all kinds of goodies straight from TDR and mark the 35th anniversary of Toyota Racing Development. While the engines of the TRD Pro Series trucks have been left untouched, TRD has lifted their suspensions by up to 2 inches. Other enhancements include front skid plates, remote reservoir Bilstein shocks, off-road tires, and TRD specialty pressure exhaust systems (on the Tundra and Tacoma). Other body modifications include TRD-unique grilles, badging, and three exterior color choices: the Inferno Orange pictured, or white or black. Gearheads who want to enhance the TRD Pro Series trucks even further can get aftermarket superchargers, cold air intakes, and more. Toyota hasn’t yet released pricing for the TRD Pro Series trucks, but you can expect them to hit roadways (and off-roadways) this autumn. For more information on Toyota Racing Development and its 35-year history, check out the brand’s official press release.